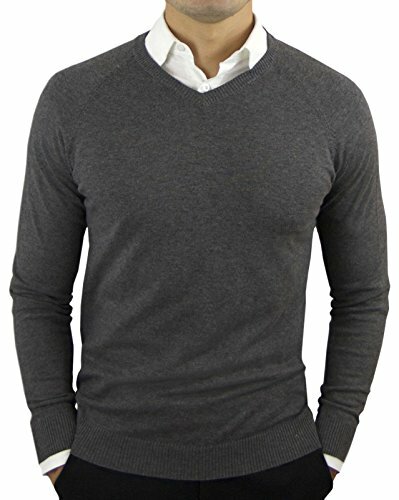 Comfortably Collared Men's Perfect Slim Fit Lightweight Soft Fitted V-Neck Pullover Sweater, Large, Charcoal Gray | What Should I Say? At Comfortably Collared, we didn't start with the idea of being a high fashion brand. We started out of pure frustration from clothing that didn't fit an athletic or slim body type without requiring tailoring, or spending a fortune. We wanted soft, comfortable, great fitting clothing, made from high-quality fabrics, which could be worn off the shelf, at a reasonable cost. Every style in our line is the result of rigorous and ongoing research, thanks to our faithful customers and their invaluable feedback. We know that comfort and style CAN go together in everyday clothing, and we're not willing to compromise on either. Our line of men's wear includes quarter zip pullovers, crew neck pullovers, long sleeve polo shirts, short sleeve polo shirts, V-neck pullovers, performance dress shirts, and the patented under sweater hybrid dress shirt. Choose this highly durable pullover sweater for the perfect slim fit look which doesn't fade, shrink, or get loose. Always the first choice of fashion conscious men to deliver higher performance while staying in style. It pairs perfectly with our Under Sweater Dress Shirt and Polos. It is perfect for business casual, school, or a relaxed outing, day or night. You no longer need to sacrifice fit or comfort to be fashionable. Join the Comfortably Collared movement.